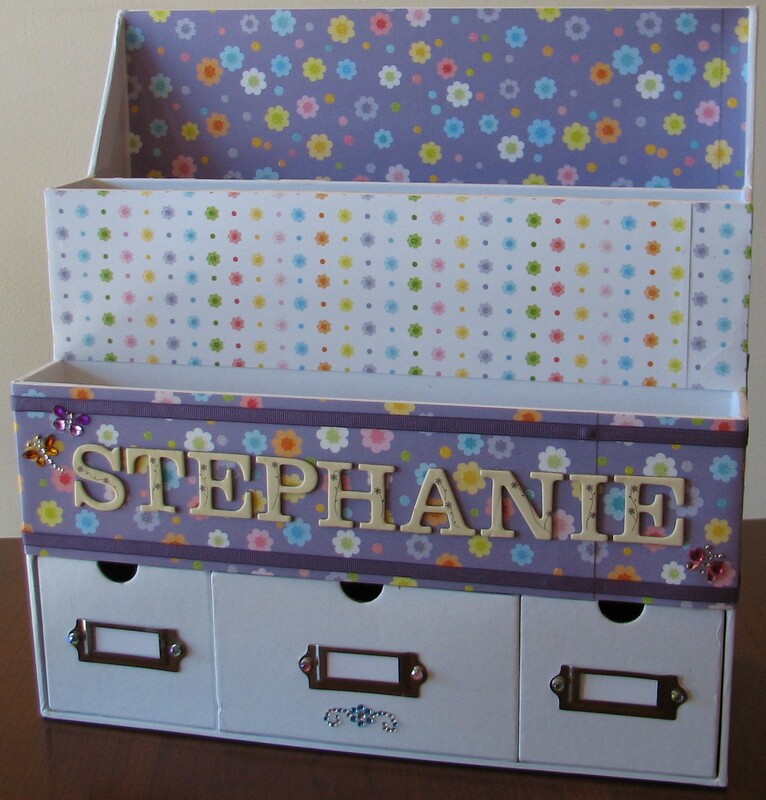 Gee, this might turn into a mini series of decorating your scrapbooking tools and more! It all started when I finally got around to decorating these jars. 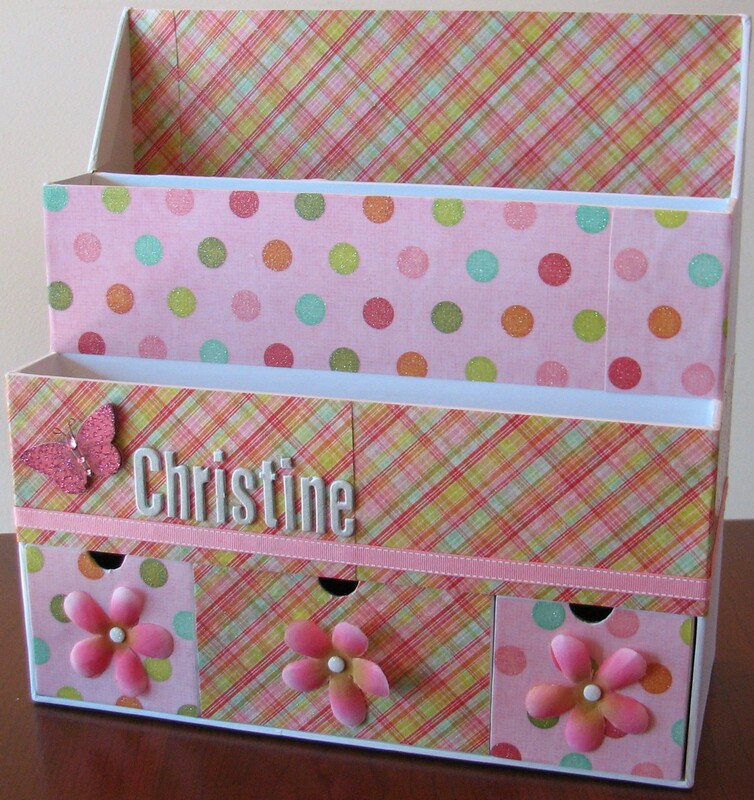 Products used: MM organizer, CTMH Tickled Pink papers, CTMH Sparkles, Kaiser rhinestones, Prima Say it in Style Crystals, Petaloo flowers, and Mod Podge. Products used: MM organizer, My Mind’s Eye papers, unknown flowers, Heidi Swapp chipboard letters, MM paint, unknown ribbon, Dress It Up Glitter Dots, K & Company Grand Adhesions butterflies, and Mod Podge. Products used: MM organizer, GCD Studios papers, DCWV Glitter stack papers, Cosmo Cricket chipboard letters, Michael’s rhinestones, Darice rhinestones, MM paint, unknown ribbon, and Mod Podge. Embellish is defined as: to make beautiful, decorate. 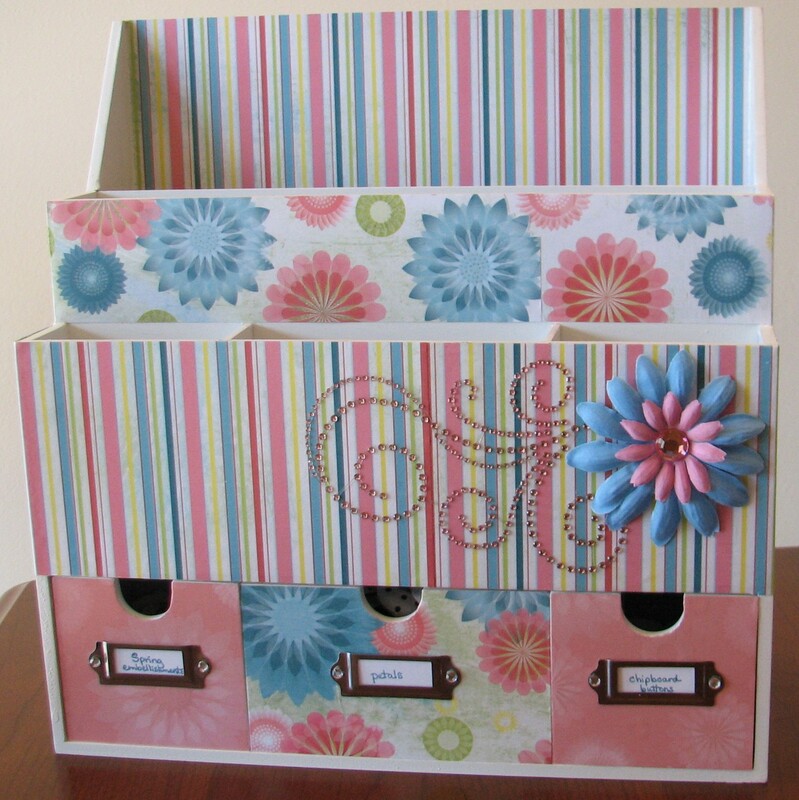 This is exactly what I have been doing with all my scrapbook organizers and tools lately. It makes my scrapbook room even more enjoyable and inspiring. These Making Memories desk organizers come in a plain white. They are nice as is but I have enjoyed making them my own. I bought one from Crop Chocolate and had trouble finding more after that. I thought I found a good deal on my additional ones and was disappointed. I learned that even though they advertise with the same picture and they are both MM, I should have bought the ones that were $40 and not $20. The first one I got is actually wood, solid, and heavy. The other ones I thought I found at a decent price are cheap cardboard/chipboard-like. They are very like-weight and will definitely not last as long. Christine wasn’t very happy with me that she had to trade with me so I could have the nice one 🙂 but I made it up to her by decorating them. Now if Michael’s ever gets my set of drawers in again I will show you some other things I have done. Have a great day!